Hello! I am a baker and friend of Amanda’s. A few weeks ago, Amanda asked if I would share a recipe for her journal. I immediately knew I would contribute my roasted almond scones with lemon curd. I love this scone recipe because it is a classic base that you can add flavor to. 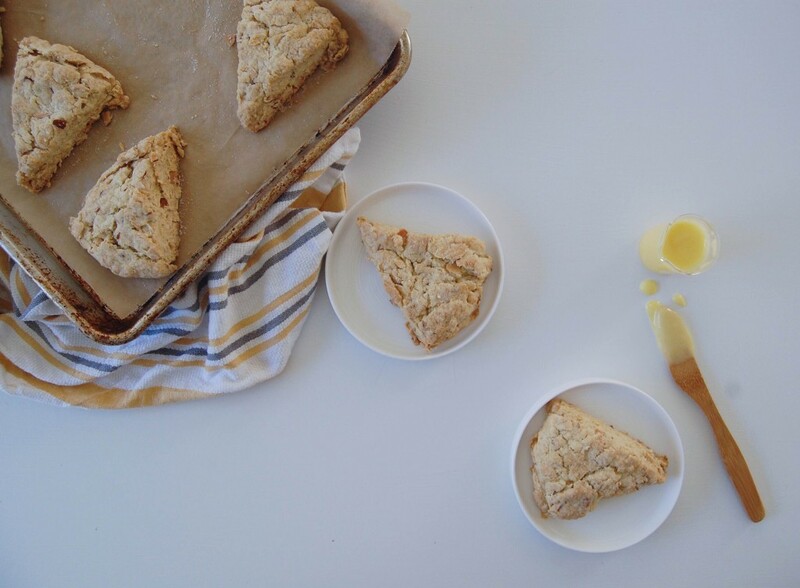 This was actually the first time I paired lemon curd with these scones; I was really pleased with the way the two flavors complimented each other. I am so honored and thankful to Amanda for opening her home and sharing this space with me. I hope you all enjoy! Lemon Curd first so it has time to cool. ∙In a bowl that you can use as a double boiler, whisk eggs, sugar, and lemon juice. ∙Place the bowl onto a pot of boiling water over the stove. Be careful that the water isn’t touching the bowl. While the mixture is cooking continue to whisk so the eggs don’t curdle. You want to continue cooking until the curd becomes thick, about ten minutes. ∙Once thick remove from stove and pour through a thin strainer. ∙Whisk in the butter and lemon zest. Before you leave the curd to cool in the fridge, cover with plastic wrap touching the curd so a skin doesn’t form. ∙In a 350 preheated oven, toast almonds until they’re brown, roughly 10 minutes. Allow to cool. ∙In a bowl, mix together your dry ingredients, then add chunks of butter. You want to make sure you use very cold butter. If your butter is too warm, it will be easy to over mix and cause the scones to become cake-y. With your hands, incorporate the butter into the flour. You want to breakdown the butter so that there are no longer chunks, just little pebble-like pieces. 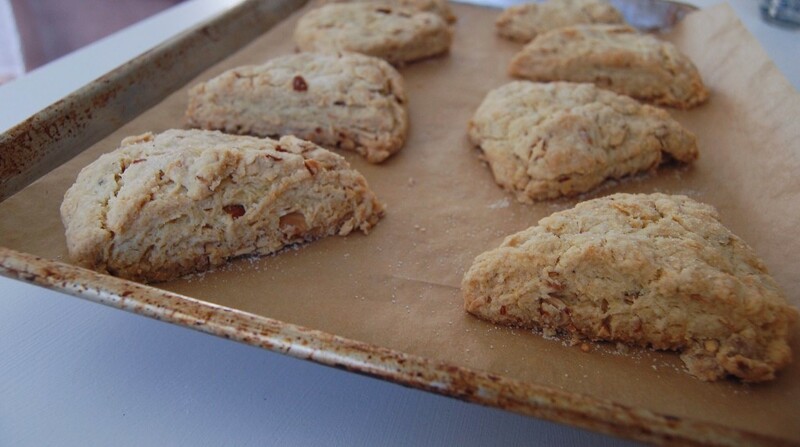 ∙Add the almonds; if they haven’t cooled completely, just pop them in the fridge. 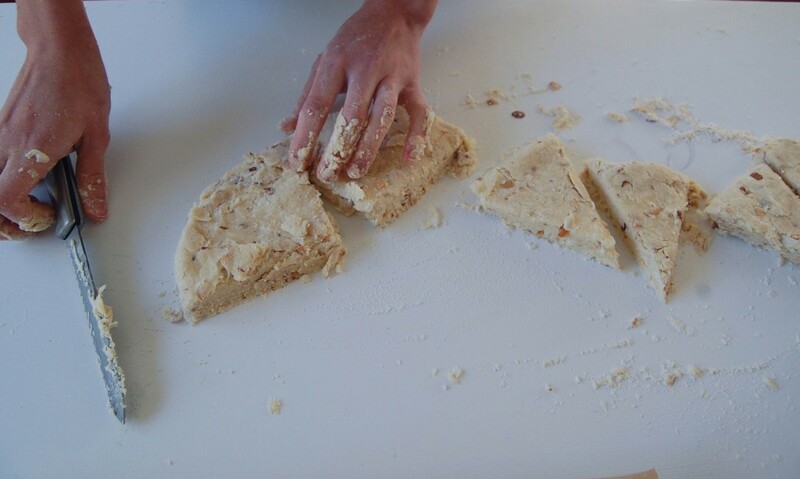 Work the almonds into the dough, breaking them into smaller pieces. ∙Add heavy cream and vanilla. Gradually incorporate the cream into the flour until it all comes together, keeping in mind not to over mix. 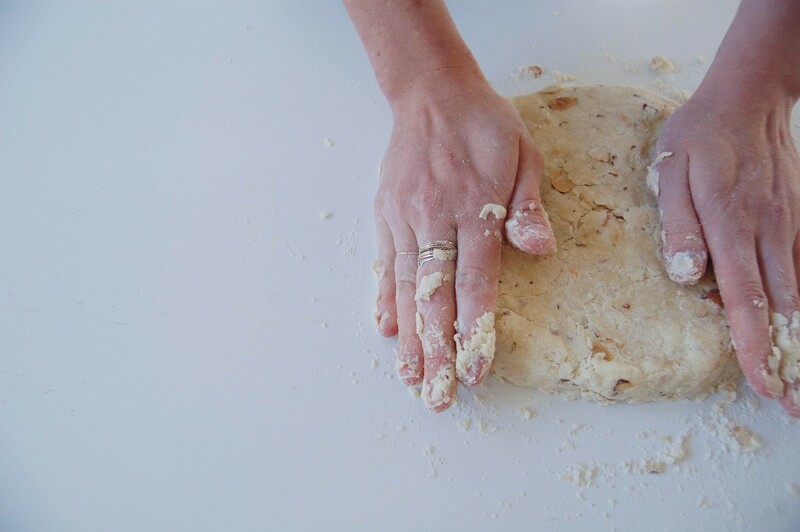 ∙Once your cream has been mixed in, you can turn your dough onto a floured surface and shape into a disk. 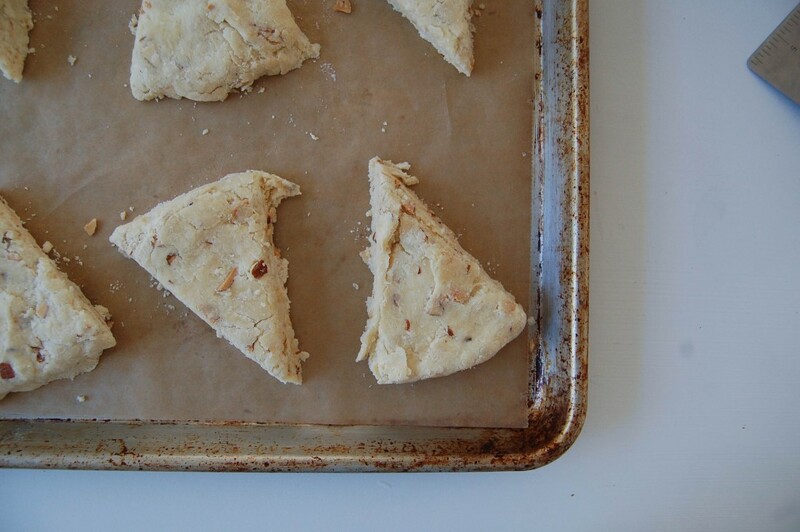 ∙Cut your scones into eight even slices and place on a sheet pan lined with parchment paper. ∙Before placing them in the oven, dust the scones with some sugar. Each oven is different, but start out with ten minutes then rotate for another ten. They should just be golden brown when finished baking. Finally, make yourself a cup of coffee or tea.